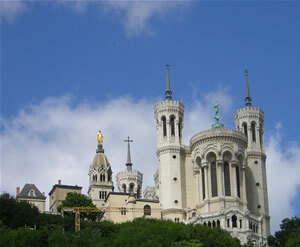 The “Society of Mary” came to birth on 23rd July 1816, at the sanctuary of Notre Dame de Fourvière (Our Lady of Fourvière in Lyon, France). The founders: a group of twelve seminarians, among them Jean-Claude Colin and Marcellin Champagnat. Their vision was all embracing: this ‘Society of Mary’ to which they were committing themselves would gather together priests, brothers, sisters and a third order of lay men and women. It would be a “family” with four branches. They were bound together by their spiritual ideal: to put themselves, like Mary, at the service of the Church through a work that was discreet and hidden, yet generous and dynamic. The foundation of a Society bearing the name of Mary “to respond to the great needs of the peoples” became a reality with Jean Claude Colin. In a dechristianised France, the Marist Fathers conducted missions in the countryside and set up schools. In 1836, at the request of the Pope, they agreed to go to Oceania. Father Favre, first successor of Father Colin, supported our Pioneers. Today, about 1,100 Marist priests are dispersed in all the continents. Marcellin Champagnat was part of the Fourvière group of twelve. Quite a young priest, (he had been ordained only the day before, 22 July 1816), he wasted no time setting up the project so dear to his heart: to train primary school teachers and catechists for schools in the countryside. The Marist Brothers have been in existence since 2 January 1817. Religious men but not priests, 4,000 Marist Brothers now work in 76 countries in schools and in many other educational, developmental and catechetical projects. The Congregation began at Cerdon in 1817 and continued to develop at Belley, in the district of Ain. The Marist Sisters recognize Jean-Claude Colin as their founder and Jeanne-Marie Chavoin as their foundress. Like Jean-Claude Colin, Jeanne-Marie takes the mystery of Mary present in the new-born Church as the daily inspiration of her life and her activity. Following her example, 400 Marist Sisters are today living their mission in the Church especially with young people, the poor and the sick, in Europe, Oceania, the Americas and Africa. We belong to the “Marist Family”. Our story is found on this website. From the beginning lay people have wanted to live the Marist spirit. They have formed groups around the religious - Fathers, Brothers, or Sisters. These groups have taken on different forms: in one country, a Third Order; in another, Fraternities… but, whatever their name, these groups gather together men and women, married or single, who wish to be inspired by the Marist intuition in order to live their commitment as lay persons in the Church and in the world.